The MBTA Retirement Fund’s performance appears “too good to be true,” said Harry Markopolos, the whistle-blower who identified the Bernard Madoff fraud. A six-month examination of the MBTA pension fund, led by the whistle-blower who identified the Bernard Madoff fraud, found accounting and investment reporting practices that he says may overstate the financial health of the transit worker retirement plan by as much as $470 million. The analysis raises serious questions about how the $1.6 billion pension is run, said Harry Markopolos, a Massachusetts-based financial analyst whose warnings about Madoff’s investment scheme were ignored for years by securities regulators. Markopolos, who enlisted the help of Boston University finance professor Mark T. Williams, presented the findings of their 103-page report on Friday to officials from the US attorney’s office, the FBI, the Securities and Exchange Commission, and the Massachusetts inspector general’s office. Officials with the four government agencies declined to comment on the meeting. He said the pension staff will have to review the report thoroughly in order to respond to some of its specific assertions. The pension plan, which is partly funded by taxpayers, covers 12,000 workers and retirees of the Massachusetts Bay Transportation Authority. The report, based on the limited data made public by the T’s pension board, studied the fund’s annual reports from 2009 through 2013. It questions whether the fund’s reported investment returns are accurate, including a year when they were identical to the state pension fund’s rate of return. It says that the pension was using outdated mortality tables that understate how much it will owe retirees over the long term. And it says the fund used three different accounting approaches in as many years, with the changes yielding more favorable financial results. Markopolos began the analysis in December 2013. That month, the Globe reported that the T pension fund had failed to disclose a $25 million loss on an investment in a hedge fund that went bankrupt. The pension fund made the investment in Fletcher Asset Management in 2007, at the recommendation of former T pension executive director Karl White, who had by that point resigned to work for Fletcher. The attorney general’s office at the time launched an investigation into the Fletcher investment. The Globe is suing the pension fund to obtain records related to the Fletcher transaction. The researchers working with Markopolos said they focused first on investment returns that were strikingly similar to those of the much larger state pension fund, which are reported earlier each year. In 2009, the returns were identical, at 17.7 percent — a result Markopolos and Williams say has a 1-in-4 million chance of occurring. According to their presentation, a copy of which was provided to the Globe by Markopolos, the authors and their team of researchers and forensic accountants found what they called 12 red flags in the fund’s reporting. They said the financial discrepancies they identified included alleged instances of overstated assets and understated obligations. “They brought up very good points that deserve investigation,’’ said Sheila Weinberg, chief executive of Truth in Accounting, a Chicago group that analyzes public pensions and reviewed the report’s findings for the Globe. Weinberg said the T pension, like some other public retirement plans around the country, needs to provide better disclosure of its finances. “The public is who’s going to be on the hook,’’ she said. Markopolos, a Whitman resident who now works on complex financial cases full time, and the other researchers are not being paid for their T analysis. Nor do they intend to file a whistle-blower lawsuit, which in a successful case could generate a large payout. The Markopolos report blasts the pension fund’s board and executives for failing to provide clearer information about financial results and audits. The authors said their analysis was limited in some aspects because the pension fund discloses so little information about its investments and operation. The pension fund — covering 5,800 active and 6,300 retired transit workers — is organized as a private trust, even though taxpayers and T riders have contributed more than $628 million to its portfolio over the last 18 years reported in the annual report. The fund’s managers and board have refused to release many of its records despite a law signed by then-Governor Deval Patrick aimed at requiring it to follow open records laws that apply to public agencies. Among the key findings of the Markopolos report is the pension fund’s decision to use a different accounting approach to calculate its assets three years in a row. According to the report, that practice alone could account for a $96 million overstatement of the assets. The report also asserts that the T pension fund may be understating its liabilities, or the payments it will owe to retirees. That’s a key figure that taxpayers and lawmakers focus on with pensions for public workers, because shortfalls can require larger contributions of money down the road. A large portion of that discrepancy, the authors say, is attributable to the T’s use of outdated mortality tables for projecting its pension obligations to retirees. The older statistics do not reflect the fact that people are living slightly longer. In a comparison to the seven other major US transit authorities, the T pension system was the only one still using calculations from 1994, according to the report. The others are using updated data from 2000, or custom data sets, the report said. 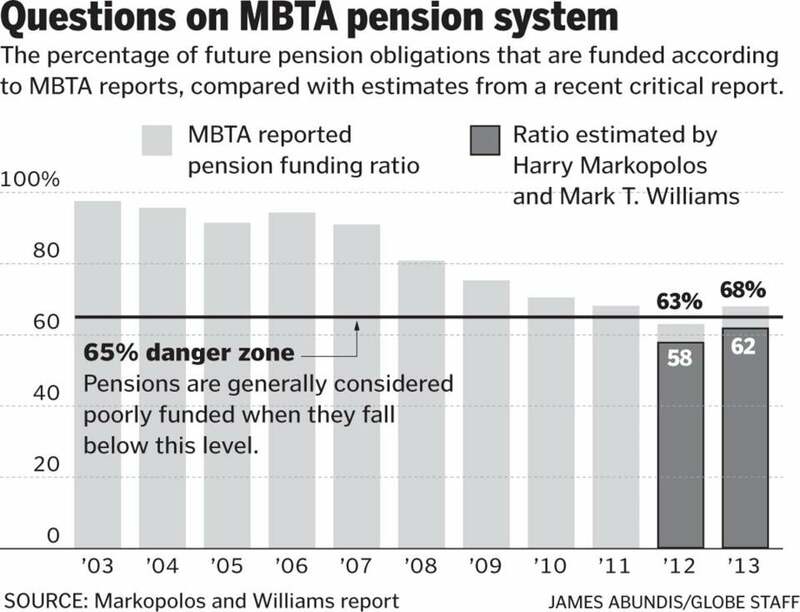 That means the T could be underestimating how long its retirees will live, and how much it will owe them by about $105 million, according to Markopolos and Williams. Jean-Pierre Aubry, an assistant director at the Center for Retirement Research at Boston College, said the vast majority of pension plans use the 2000 table, with adjustments. Only the T’s actual mortality records would show whether its assumptions are accurate, he said. “It could be their population really is different from the rest of the world and die sooner,’’ Aubry said. The report also criticizes the T pension fund for increasing its actuarial rate of return at a time when others are lowering theirs. The rate is an annual investment target that, if missed, requires larger cash contributions by the MBTA or workers. The T pension raised its actuarial rate of return from 7.5 percent in 2010 to 8 percent in 2011. The state pension fund also was at 8 percent, but was lowered to 7.75 percent in January. 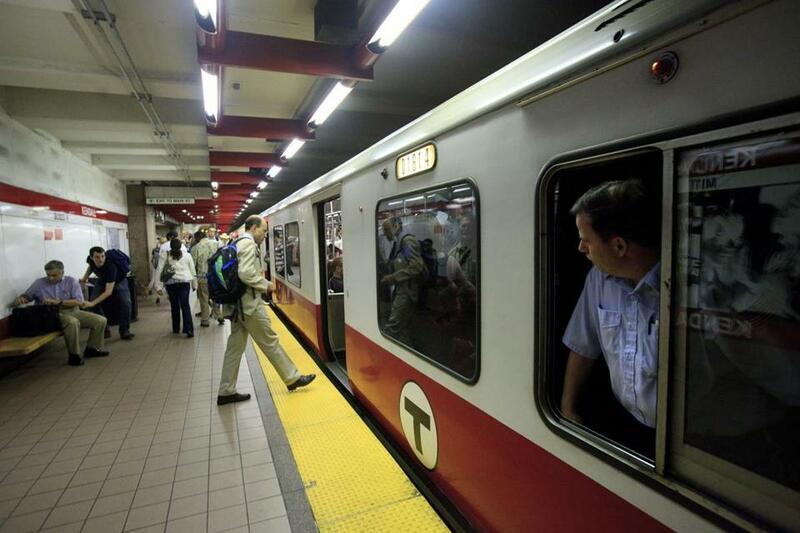 By raising the anticipated rate of return, the report says, the T improved its funding ratio. In the 2013 annual report, the pension fund reported that its future obligations to pensioners were 68 percent funded. At the previous actuarial rate, the ratio would have been 62 percent, and in 2012 it would have dipped to 58 percent. Pensions are generally considered poorly funded when they fall below 65 percent. The accounting methods and mortality assumptions are issues that the pension fund’s auditor, KPMG, should have flagged, Markopolos said. The New York-based audit firm is also the auditor for the MBTA. KPMG spokesman Robert Wade said the company declined to comment due to client confidentiality. The Globe has previously reported that KPMG routinely reviewed T pension reports that omitted essential parts of financial reporting. As a result, the firm offered only qualified endorsements of the annual reports in recent years. In a detailed analysis of 2012 and 2013 investment returns, the Markopolos report said the T fund outperformed the market significantly across several stock and bond categories. For instance, in emerging market stocks, the T posted a 30.4 percent return in 2012, trouncing a 16.1 percent return of the MSCI All Country World Index, which the fund considered an appropriate benchmark. Across all its stock holdings, the T fund reported beating its benchmarks by 6.3 percentage points in 2012 and by 5.6 percentage points in 2013. At the same time, the pension lost money in hedge funds, private equity, and other alternative investments in those years. Overall, the T pension reported annual returns the same or better than the $62 billion state pension fund’s in five out of six years from 2008 through 2013. Last year was an outlier, when the T reported a 5.5 percent gain while the state fund was up 8.2 percent. The Markopolos report concludes that it’s unlikely the T could beat the more sophisticated state fund so many times. The authors could not reconstruct the T fund’s reported returns in 2012 and 2013 by applying their reported mix of investments to the benchmark returns in those sectors. The questions raised in the report reflect broadly on the pension system’s management as well as its six-member board, half of which was recently replaced by Governor Charlie Baker’s administration. The three legacy board members include two officers of the Boston Carmen’s Union, Local 589, and a representative of another union for transit workers. The three new members include Steve Grossman, a former state treasurer who spent the last four years as chairman of the state pension fund. Grossman has said he will press for greater disclosure and openness by the T pension fund. At the first meeting of the new trustees on June 19, a Globe reporter was not allowed to sit in on the session. With its private trust status, the pension fund does not make its meetings open to the public, and is not required to follow the ethics and conflict-of-interest rules of public agencies. The Markopolos report notes that the board’s prior makeup included only one person with a financial background: Jonathan Davis, chief financial officer for the MBTA. Pension boards often rely heavily on outside consultants for investment advice. The T pension replaced New England Pension Consultants in August 2009 with the Marco Consulting Group. Julian Regan, the T’s consultant with Marco, worked for the T in financial positions, including budget director, from 1996 to 2000. The pension fund’s executive director, Michael Mulhern, was chief operating officer of the T at that time. In e-mailed responses to Globe questions, Regan said Marco was retained by the T pension fund after a competitive bidding process. The Markopolos report calls the costs of running the plan “excessive,” with administrative expenses for a staff of 12 running nearly $4 million in 2013, on top of $7.8 million paid out to 71 investment managers. Correction: An earlier version of this story stated that the investment return target for the state pension had fallen to 8 percent. That was true for the period analyzed in the Markopolos-Williams report. On Jan. 1 it fell further, to 7.75 percent.